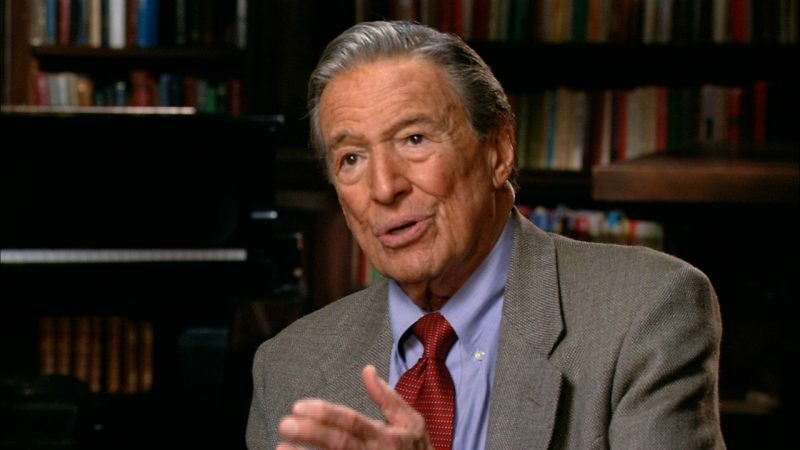 As a correspondent for CBS’s “60 Minutes” for 40 years, Mike Wallace was known for his tough interviewing style and investigative reports. Wallace started his career in entertainment broadcasting but focused on journalism upon joining CBS in 1963. He interviewed world leaders, artists and entertainers, and celebrities ranging from Iran’s Ayatollah Khomeini to Henry Kissinger, Salvador Dali and Roger Clemens. He died on April 7, 2012, at the age of 93. Mike Wallace remembers his unexpected friendship with former Vice President Richard Nixon on the way to his 1968 election as president and his decision to become a "60 Minutes" correspondent instead of possibly joining the Nixon administration. Mike Wallace talks about his exclusive interview in 1979 with Iran’s Ayatollah Ruhollah Khomeini. Graduating with a bachelor’s degree from the University of Michigan, Myron Leon Wallace enters the burgeoning field of broadcasting as a newscaster, announcer and writer for WOOD-WASH Radio in Grand Rapids, Mich. Joining the U.S. Navy, Wallace trains as a naval communications officer and is stationed in the Pacific for three years. After his discharge from the Navy, Wallace rejoins Chicago Sun’s “Air Edition” while continuing with various freelance jobs in radio, commercials and entertainment programming. Joining producer Ted Yates, Wallace becomes a news anchor and interviewer on “Night Beat” in New York. It starts by airing twice a night; the following year, in order to conduct more hard-hitting interviews, it transitions to one nightly program. Wanting Wallace’s team to join the network, ABC offers “Night Beat” the chance to have a national audience in prime time. Although initially hesitating, Wallace accepts the offer, and the show is renamed “The Mike Wallace Interview.” Typical of the edgy editorial style introduced by Wallace to the relatively new genre of television is a show he does about Margaret Sanger , leader of the birth control movement in America. After “The Mike Wallace Interview” ends, Wallace takes on various jobs including narrating and conducting interviews for a program called “The Race for Space.” The award-winning show is a success and leads to a popular, 65-show broadcast series, “Biography,” presented by Wallace. On special assignment for the Westinghouse broadcasting chain, Wallace travels around the world—Tokyo, Taipei, Hong Kong, Saigon, New Delhi, Cairo, Nairobi and London—producing and delivering a series of radio reports. Wallace covers the Vietnam War several times over the next four years. He also reports on Richard Nixon’s 1968 presidential campaign. Turning down a position on Nixon’s campaign staff as press secretary, Wallace accepts an offer from veteran CBS executive producer and director Don Hewitt to anchor (initially with Harry Reasoner) a new primetime magazine broadcast, “60 Minutes.” Wallace remains a full-time correspondent with the show until 2006. Wallace interviews the Iranian leader Ayatollah Khomeini, using his trademark “forgive me” to ask his reaction to being called a lunatic by Egyptian President Anwar Sadat. In a “CBS Reports” 90-minute documentary, “ The Uncounted Enemy: A Vietnam Deception ,” correspondent Wallace interviews U.S. Army Gen. William C. Westmoreland. He confronts the general with comments from officers under his command in regard to how the Pentagon falsified intelligence estimates of the enemy’s strength and withheld information from Washington and the press. The report results in a $120 million lawsuit by Westmoreland, which lasts nearly three years until CBS issues an apology and the case is dropped. Wallace writes his first memoir, “Close Encounters,” with Gary Paul Gates. The Chicago Museum of Broadcast Communications honors Wallace for his lifetime contribution to radio and television. CBS News presents a one-hour special, “Mike Wallace Then and Now,” which highlights important interviews conducted by Wallace, looking back through 50 years of his career. Wallace is inducted into the Television Academy Hall of Fame and receives the Paul White Award, the highest distinction from the Radio/Television News Directors Association. The International Radio and Television Society names Wallace the Broadcaster of the Year. For an exclusive interview with Kofi Annan, Wallace accompanies the then U.N. secretary-general to negotiations with Iraqi President Saddam Hussein in which Annan successfully averts a U.S.-led invasion of Iraq. During these negotiations, Annan persuades Hussein to stop restricting inspections of eight suspected weapons sites. Wallace sparks controversy over his interview with Dr. Jack Kevorkian . “Dr. Death” gives “60 Minutes” footage in which he injects a patient with lethal drugs. Kevorkian is eventually convicted of second-degree murder. In a controversial conversation, Wallace interviews Louis Farrakhan and Atallah Shabazz, Malcolm X’s eldest daughter, who accuses Farrakhan of having an indirect influence on her father’s death. During the exchange, Farrakhan concedes that his words may have motivated the assassination. Wallace receives a Lifetime Achievement Emmy. Wallace’s second memoir, “Between You and Me,” co-authored with Gary Paul Gates, is published. He also interviews baseball player Jose Canseco , who admits to taking performance-enhancing drugs. After 38 years, Wallace retires as a full-time correspondent for “60 Minutes,” announcing that he will become a correspondent emeritus, occasionally interviewing people for the broadcast. With the Bush administration refusing to hold any diplomatic talks with Iran, Wallace returns to the airwaves to interview Iranian President Mahmoud Ahmadinejad. They discuss his views on U.S. involvement and policies in the Middle East, Iran’s efforts to become a nuclear power and Ahmadinejad’s public avowal to destroy Israel. The interview wins Wallace his 21st Emmy. Wallace is the first person to interview Jack Kevorkian upon his release from prison. Roger Clemens talks with Wallace in his first interview after the Mitchell Report on drug use in Major League Baseball accuses the award-winning pitcher of using steroids. Wallace dies on April 7 at the age of 93 in a care facility in New Canaan, Conn.
“Mike Wallace Asks: Highlights from 46 Controversial Interviews.” New York: Simon & Schuster, 1958. “Close Encounters” (with Gary Paul Gates). New York: Morrow, 1984. “Between You and Me” (with Gary Paul Gates). New York: Hyperion, 2005. “The Way We Will Be 50 Years from Today: 60 of the World’s Greatest Minds Share Their Visions of the Next Half-Century” (editor). Nashville, Tenn.: Thomas Nelson, 2008. “Heat and Light: Advice for the Next Generation of Journalists” (with Beth Knobel). New York: Three Rivers Press, 2010.